Perinatal Associates of New Mexico is proud to offer the most advanced ultrasound systems available. Using state-of-the-art equipment and 2D, 3D, and 4D techniques our expert ultrasound team is able to create a complete picture to help you better visualize the features of your developing pregnancy. 2D ultrasound is the main diagnostic method for evaluation a pregnancy and involves sending sound waves straight down and back to create an image. Both 3D and 4D ultrasound methods send sound waves at three angles to render a three-dimensional volume image. 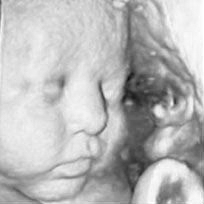 4D ultrasound, however, is performed in real time with no delay in image creation. There’s nothing better than the moment when a family first sees the image of their growing baby and no better place for expecting mothers to be than with the experienced and nurturing ultrasound experts at PANM. If it would not have been for Perinatal Associates of New Mexico and for the amazing care provided by all staff here, my son would not have made it into this world! He was a complete surprise and shock to my husband and myself! From not knowing that I was pregnant to becoming high risk and getting in so quickly and being watched so closely to being able to welcome a new baby into our home would not have been possible without the care and concern of these wonderful people! I cannot express the gratitude in any amount of words that I have for the people at this place! This is a great place and people really do care about you as well as your baby! So friendly and understanding on so many levels! I will forever be grateful for everyone who helped us welcome a beautiful baby boy into this world!